Called the best friend Israel ever had in the White House, George W. Bush is, in my view, worrisomely over-confident. He believes he has discovered the solution to a highly complex and subtle century-old conflict. But I expect major problems. 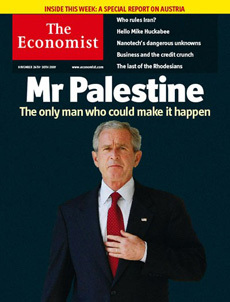 The cover of the Nov. 24 Economist shows a picture of Bush under a bold headline that reads "Mr Palestine." The subtitle deems him "The only man who could make it happen" – with "it," of course, being a Palestinian state. The title is especially provocative when one recalls that for many years Yasir Arafat was the one known as "Mr. Palestine." But the nickname is apt, for soon after becoming president in 2001, Bush indicated an intention to sponsor the creation of a Palestinian state, this being his solution to the Arab-Israeli conflict. Since then, he has steadily made that his goal. I have often criticized him for this, in particular after his major June 2002 speech. At present, I worry that his erroneous course will culminate in a misbegotten and perhaps disastrous parley at Annapolis. I foresee no good coming of this meeting and what follows it. At best, circumstances will render it harmless, another forgotten "peace" gambit, like those of the Geneva Accords, the Quartet, the Roadmap, the Mitchell Report, the Tenet Understandings, the Abdullah Plan, the "benchmarks" for peace, and the Zinni, Wolfensohn, Ward, and Dayton missions (and who knows how many plans the world and I have forgotten). Nov. 28, 2007 update: Good news: Effort #11 was announced today, the Annapolis Foundation, headed by James L. Jones, who will act as a liaison between Israel and the Palestinian Authority. Am eager to see the results. Apr. 23, 2008 update: Also announced in the aftermath of the Annapolis was the position of monitor of the road map, filled by Air Force Lt.-Gen. William M. Fraser III. But Fraser has just been nominated to become the commander of the United States Transportation Command, headquartered at Scott Air Force Base in Illinois, bringing his road map career to an end before long. And, according to a report in the Jerusalem Post, American officials have said there are no plans to replace Fraser. Nov. 7, 2008 update: It's no surprise but it's good to hear it from the horse's mouth: "The White House made it official yesterday: There will be no Middle East peace pact on President Bush's watch," writes Glenn Kessler in "No Mideast Deal Under Bush, White House Says." White House spokeswoman Dana Perino put it this way: "We do not think that it's likely that it would happen before the end of the year." Secretary of State Condoleezza Rice, however, continues to believe it all amounted to something: "I am so confident that the Annapolis process that was launched, now less than a year ago, is an extraordinary breakthrough in the history of this conflict."